There may be no legal impediments keeping foreign companies from building roads in Russia, but there are plenty of other problems. In one of the first presidential decrees of his new term, Vladimir Putin gave the government until December to find a way to encourage foreign companies to build roads in Russia. According to an expert at Rosavtodor, there are almost no foreign firms among those with highway contracts. Rosavtodor has reviewed the existing industry restrictions imposed on foreigners and found that there is nothing in the legislation preventing foreign firms from operating in this sector, rather it is with technology, new materials, and the state procurement system that problems tend to arise. In order to be able to use new technology or materials not listed in Russian regulations, their “suitability for use” in Russia must first be confirmed. The government decree addressing the suitability of new technology dates back to 1997 and was adopted, according to the document, “for the purposes of protecting the country’s domestic market from the unreasonable use of new materials and technology.” To use innovative road materials, bridge or tunnel designs, or “elements of improvement,” samples must be provided for review to the Federal Scientific and Technical Certification Center and technical certificates must be issued for them. Applications take three months to process, and certificates are issued by the Ministry of Regional Development. The law on state procurement also presents obstacles for would-be foreign contractors: tenders must be awarded to bids with the lowest prices, meaning that foreign companies whose work may be of higher quality, but more expensive, can be out-priced by domestic competitors. Furthermore, current financing rules prohibit design and construction from being lumped together, forcing contractors to use ready-made designs. 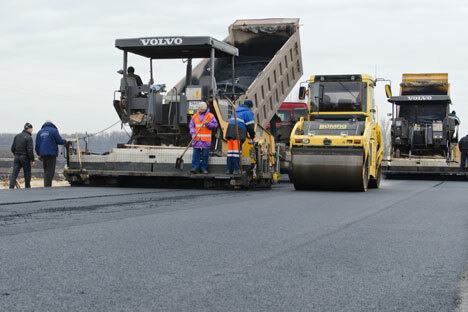 There are other reasons foreign firms don’t bid on Russian road contracts, according to one employee at a construction company: foreigners are not familiar with the Russian market and administrative practices; they have to plan for excessively high risks, which drive project prices up; and finally, foreign companies assume a return on investment (ROI) of at least 18 percent, while Russian contractors shoot for 7 perecnt. That said, foreigners often act as subcontractors in large-scale projects. For example, the French company Freyssinet supplied stay cables for the Golden Horn and the Russky Island bridges in Vladivostok and the Italian company Rocksoil supplied technology for boring road tunnels in preparation for the Sochi Olympic Games, according to a representative of the general contractor Transstroy. The representative added that construction companies are always on the lookout for advanced technology, while for the Italians this is an opportunity to showcase their capabilities in a new market. This is why they were present to monitor every stage of construction. But it is as partners in projects involving the construction and management of toll roads that foreign companies have been most active, including Portugal’s Brisa and Lider Asset Management Company; France’s Vinci and N-Trans Group,: Austria’s Kapsch and Mostotrest. All those projects are jointly financed by the government and private parties and involve allocation of risks among the participants, Goldman Sachs analysts said in an industry report. Moreover, the contractor is often responsible for preparing the land and rearranging utilities, which requires working together with numerous government agencies – an expertise international companies lack, Goldman Sachs noted.